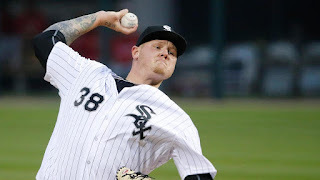 Matt Latos allowed two hits in 6 1 /3 scoreless innings and was supported by home runs from Todd Frazier and Jose Abreu in the 5-0 White Sox victory over the Angels on Tuesday night at U.S. Cellular Field. Albers extended his scoreless innings streak to 30 over 27 appearances. That streak dates back to Aug. 5, 2015. In the eighth, Melky Cabrera added a two-run triple and Brett Lawriedrove him in with a single to give the White Sox some breathing room.